Nonna always enjoys a good giggle. As I sprint through the average day, I am far from health conscious, but that’s because I know that life is a marathon, more about survival than winning. I soak in the balm of silence, the first hour and a half of solitude in over 7 weeks. All I have to do is collect my prescription and make a picnic. Two minuscule tasks to complete in ninety, whole, tantalizing minutes. Bliss! The silence is tangible. The boys are in morning Summer School, my daughter is in soccer camp, Nonna, nearing the end of her visit, is in the Mall shopping for gifts for her return. I have promised my daughter that we will come and watch her soccer match, the climax of the week. If necessary, I shall bribe Nonna to care for the boys and go alone, but by hook or by crook, we will be there on time. Otherwise I fear she’ll put herself up for adoption. I know that Nonna is gainfully occupied. When I dropped her off at the shops she was gleeful at the prospect of the glorious exchange rate:- two dollars to the pound. Her money will go twice as far. I confirmed that I would collect her at 12:30 sharp, in order to be back in time for the bus delivering the boys home. I make preferred sandwiches and assemble supplies, a great quantity of props and bribes to entertain the boys whilst I watch the soccer match. I complete all household duties in record breaking time. I bimble up the road to collect Nonna with bags of time to spare. I listen to the radio to exercise my brain and broaden my tiny horizons. I cruise the edge of the Mall in case she has finished early. I loiter in a position where I have a good view of the door. I listen to the weather forecast, not a cloud in the sunny, sunny sky. The glory of California. The announcer announces something. What did he announce? He announced the time. What is the time? I check my wristwatch and compare it to the car’s clock. There is a discrepancy of two minutes, which means either Nonna is 5 or 7 minutes late. I jump out of the car and hover by the door. I peer through the window to see if she’s queuing at the check out? She isn’t. I scan the sidewalk. Nothing, or at least no Nonna. I check my wristwatch. I run our meeting arrangements through my mind again, in case I mis-spoke. Did she have her hearing aid? I try remembering if Nonna was wearing a watch? I can see her soft face, small frame and the fabric of her sleeve but I just can’t focus on her wrist, nor her ear and the hearing aid. All these thoughts cost precious seconds. I re –check my wristwatch. I think of the boys arriving home to an empty house via the jolly yellow school bus. What do they do with children when they find that no-one is home? Do they take them to foster homes? I have no idea. This has never happened to me before. I try not to see their distraught little faces, the meltdowns at the breakdown in routine. Should I stay or should I go? I lunge into the shop and run up and down the aisles flip flops flapping. I don’t call her name out loud, as I know she wouldn’t hear me, with or without the hearing aid. I sweep past the attendant to check the changing rooms. I am quite certain that none of the feet that I can see under the doors, belong to Nonna. I race back to the front in case I’ve now missed her on the sidewalk. I remember that I have a cell phone for emergencies. I dig in my bag and attempt to use it. Who shall I phone? I phone spouse. Spouse is concerned and fully comprehends the full nightmare with very little explanation. He offers to cycle home but it will take him at least 25 minutes. I had forgotten that we are on the ‘save the planet’ campaign and he is without his car. His useless car is parked on the driveway at home, where the bus will shortly arrive. I promise to keep him updated. I snap the phone shut, drop it my bag and run back into the shop for another quick check in case she nipped in there whilst my back was turned. The lady on the other end of the line informs me that one of my children missed the school bus, or rather that the bus left without him. I have one child hurtling towards home in the bus and another stranded back at the school. She tells me that the bus will return to collect the lingerer later. I thank her and snap the phone. Brain cells fire and synapses click into place. That means that the bus will arrive even earlier, because now the driver has to speed up her deliveries in order to return to the school to collect the abandoned one! I lunge for the car hardly mindful of jay-walking. I drive home carefully. I ensure that I am exactly on the speed limit at all times, as I cannot be stopped for an inconvenient speeding ticket. Any additional delays may just push me over the edge. I will traffic lights to change in my favour. They don’t. I drive home very carefully because I cannot have an accident and my brain has turned to mush. Sweaty palms are not helpful at this juncture. I breathe very carefully because I do not know what happens if you hyperventilate whilst driving. I am being so careful that something will surely snap. My mind drifts up into the clouds so that I can see all the traffic below, one tiny little yellow bus charging back to my house, me, in my big family van, carefully wending my way to the same location. Since it is the last day of school they are bound to be even earlier, which means that my tiny window of opportunity has just closed to a crack. I keep a very careful eye out for lunatic drivers who might inadvertently delay me, as every second counts. I flip between miles and kilometers per hour, just to add further confusion. I suspect that I am the lunatic driver and open my eyes even wider. Now, anyone coming the other way will be able to see the whites of my eyes and be warned that a crazed woman is not one to be messed with. I should have asked someone in the shop if any little old ladies had had an accident in their store this morning? What if she’s forgotten her pills? So many pills, important pills for diabeties, high cholesterol, high blood pressure, great disposition. It’s past her usual lunch time, what if she’s passed out from lack of……..whatever it is that diabetics lack? No, no, no, of course! She is a diabetic, therefore she’ll have some emergency food in her bag. Did she have her bag? Must have done, she was going shopping. I run through the check list that I checked with her before she left; her glasses, reading glasses, pen, pills. I don’t remember food? Nevermind, she’s a grown woman who has the sense to know that she needs to buy something to eat. She’s in a Mall, she’s not going to starve. Did she remember her money? You can’t shop without money. She would have phoned me, but she has no phone! Why didn’t I give her my cell phone? Because she’s deaf and it’s too complex for a first time user. It’s neither. Spouse is confused by my response and wants an update on the crisis situation. I update him with my speed talking since I lack speed dialing. He offers to cycle home. I offer to puncture his tyres next time the opportunity presents itself. I snap the phone shut and leave it in my lap on the off chance that I will learn how to speed dial by being in close physical proximity to the device. I realize that when I do eventually get home, I will have no way of knowing whether the bus is about to arrive or has already left, taking my poor benighted child with her, since I failed to be there on time. I wonder if I am able to spot the bus’ tyre tracks on the drive? What would they look like? Is it dusty enough? Are there any tell tale puddles to catch out unwary bus drivers? I remember that it is over 90 degrees in the shade and that a puddle’s life expectancy is counted in milliseconds. I debate speeding. I decide not to. If I speed I will crash or run someone over, then I will be responsible for extinguishing a precious human being, ruin their life, end their life, their family’s, as well as my own. If I kill someone by speeding the bus will be late, my children will be fine and it will all have been for nought, I will have killed someone for nothing. I grind my teeth, or rather my retainer. I remember that a retainer should not be ground. I congratulate myself on the acquisition of a new skill, the ability to grind my teeth, now that they join for the first time in my life at the age of 46. I open my mouth to stop myself from ruining $600 worth of retainer. Now my eyes and mouth match, open. My heart beats so fast that I can feel it elevate. I shut my mouth before my heart pops into it. I need to calm down before my child gets home, assuming that I haven’t already missed him, which would mean that he would definitely be frantic. I need to present a composed front, so that I will be able to calm down my frantic child. He will be frantic because his brother is not on the bus with him, his constant companion if not his twin. I anticipate a whole slew of new neurosis pertaining to buses, yellow and otherwise, as well as other forms of vehicular transportation, for both me and them. I park at home and leap into the garden to check if any small people have been abandoned there. They haven’t. I check the house just in case they sneaked in the back or broke a window to gain entry. I curse the bus driver and her adherence to her professional ethics. I zip back to the drive way. Maybe they’re still on their way? I examine the driveway for clues. I am without clues, clueless. I dredge my brain for crumbs of ‘The Last of the Mohicans,’ that I read many centuries ago. I notice lots of twigs, pebbles and gravel, but I have no way of knowing if they have been disturbed, or if they have been disturbed, that it was the bus that was the disturber? I resolve to practice recognizing the debris on my driveway, daily. As I peer through dirty bifocals, I am covered in a cloud of dust as the bus pulls in. Hallelujah! I skip to the bus with my best ‘happy but calm’ expression on my face. As the doors pull back the bus driver regales me, “are you o.k.? You look kinda…….” she peters out and does not say ‘disturbed.’ I smile back to reveal my ever thinning retainer, as both my boys stumble down the steps. Both! Both? How did that happen? The bus driver waves goodbye and sweeps away. I embrace my lost boys and await the meltdowns. They brush me aside and head off indoors without a care in the world. I stumble in after them collecting their belongings that leave a trail in their wake. Two down, one to go. Now I must find Nonna. Please don’t let her been laid out in a diabetic stupor? My brain shifts up a gear. I must persuade my car phobic boys, to get into the car, after they have just spent 40 minutes on a bus. They are too big to carry, or drag. What am I going to do? How can I get them in the car, without breaking a limb, mine or theirs? I rely on my old friend, bribery. I ignore the current healthy food campaign. I whiz to the emergency cabinet and whip out a packet of chocolate biscuits, the cookie trap. When I return they are both breaking into the cupboard with the electronic games, the contraband, as no Gameboys are permitted until 5:30, and only if chores have been completed. I make sure that the biscuits are at their sight level as I announce the number of cookies that good boys will receive, who enter the car and have their seat belts fastened. Their howls of protest are enough to burst ear drums. Each has a hand on an electronic toy, a preferred activity. They look at the biscuits. They look at the Gameboy. There is a pause in the screaming. “I can take dis in dah car?” he asks. Both boys hover with perfect eye contact whilst I dither……..’yes! o.k.! Now, into the car as quickly as you can!” They both bounce on the spot for a few moments before collapsing on the floor clutching their games and screaming. Despite the noise, their behaviour is compliant. One crawls along the floor like a solider on manoeuvres and the other is on all fours like a puppy, but they are none the less, moving in the direction of the car, albeit in slow motion. As I toss their shoes into the car after them, I remember that I missed the toilet break, compulsory before any trip. Yet another campaign failure! The wolves stop howling with the first biscuit as I reverse out the garage and head off to the Mall at 39 m.p.h. “It is afternoon?” he asks. “Why we are having electronics time den?” I curse another failed campaign as my boys munch chocolate biscuits and play electronics in the middle of the day with no ‘tasks’ completed at all. I concentrate on Nonna’s rapidly decomposing body, lost in the suburbs of San Jose. I wonder if she knows the address and telephone number? I should have written it down for her, just in case! “Where we are go?” asks the little one. “We’re going to look for Nonna. You can both help me.” As soon as I’ve said it, I wish that I hadn’t. “Nonna! Nonna? Nonna? She is lost. You lost Nonna? Where she is? She is stolen? She is lost? She is dead?” I wonder, not for the first time, if this child has extra sensory perception, or simply a mind reader? “No, she’s fine, but she wanted to play…….…hide and seek with us. She’s hiding and we’re going to seek her out.” The phone rings from somewhere in the realms of the footwell of the car. This effectively prevents me from driving and speaking on the phone, as only idiots do that. I am saved from being an idiot. I turn into the parking lot and hunt for a space next to the sidewalk. This should minimize the likelihood of them being mown down by traffic when they run away, which they surely shall. One eye looks for a space, the other eye looks for Nonna. I pull into a parking spot before I go cross-eyed. I turn in my seat, with all the doors locked, as I de-brief the boys as to my expectations. I am careful to keep the tone of fear from my voice. The prospect of escaping children in opposite directions and an elderly prostrate body in need of urgent CPR, is enough to send chills down my spine. I prompt verbal confirmation that the message has been received and understood. I open the doors. They leave the car. One plummets to the ground in a heap and the other catapaults away. Clearly the message was received and understood but no-one complies. I make a mental note to redraft the message to include compliance, even if I have to write them in my own blood. I scoop up the 65 pounder and stagger down the sidewalk after the other one. Another campaign bust! The campaign to never carry anyone, under any circumstances. In the distance I recognize the pogoing form of my youngest child and yes, there is Nonna, vertical! My son’s body becomes rigid too, as his eyes register the scene. He slithers down my body like a plank and gambols off in the general direction of his maternal grandmother. We gather together. “Oh dear, oh dear,” she says in a slightly flustered manner and a thick Italian accent. Her hands flutter over the heads of her two grandsons. One pecks her hip with kisses of relief and slicks of snot. The other burrows his head in her waist with unsuppressed glee. She’s alive! And we still have enough time to make the soccer match. “Ave you been waiting very long?” she asks tentatively. I smile as I lie and tell the truth at the same time, “we’ve only just got here!” I bellow. I doubt if I shall ever win any races, I’m sure I shall never be fit, my mental health my be compromised but one thing I’m quite certain about, my sense of humour will see me through to the finish line, wherever that may be? You can see other Write Away posts or enter the competition yourself here at Scribbit. Posted on July 29th, 2007. My Mother-in-Law is Italian, but lives in England for her sins. She came to visit one Summer for a few weeks. 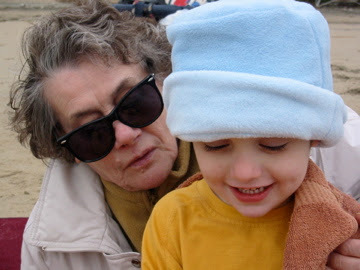 Of course all grandmothers are biased, but her delight in ‘my’ children, was balm upon my worried soul. [translation = pre-diagnoses] I’m sure that Italians have their own set of cultural norms and expectations, but they differ greatly from the British version. My children could be swinging from the chandeliers and Nonna would be there cheering them on. Few people had the patience to try and engage my son but Nonna was relentless. The bond between them shone. I could explain this phenomenon with reference to her animated face, arresting hand gestures, non-American accent, or her demonstrative nature, but such a clinical approach fails to capture the magic. One day, we went to the beach at Santa Cruz. I had carefully assembled a large pic-nic in advance, to cater to everyone’s foibles. At that time my son had a reasonable vocabulary but rarely spoke. When he did speak his only topic was Thomas the Tank Engine. He was also hyperlexic, but was in the process of losing that skill. Nonna has many skills. One of her more annoying ones, is her affinity with wild life. From insects [translation = bugs] to elephants and everything in-between, Nonna is their champion. They are drawn to her by some invisible thread. Dr. Doolittle is as nought beside this woman. Hence, when everyone had abandoned the pic-nic fare, since it is impossible to nail children down in sand, Nonna began to throw the left overs into the sky for the seagulls benefit. Within seconds we were a scene from Hitchcock. Spouse sighed and clucked, as he tried to chase the birds away. I turned my attentions to the criminal modeling inappropriate behaviour to my children, “now listen! Nonna is very naughty to feed the birds.” [translation = “flying vermin”] Nonna pulled a face, as well she might, in league with her grandchildren in a common conspiracy. She pulled him close for a snuggle, but he wriggled free to protest………. We all turned to look at him. It was the longest voluntary sentence he had ever uttered. Posted on May 2nd, 2007.